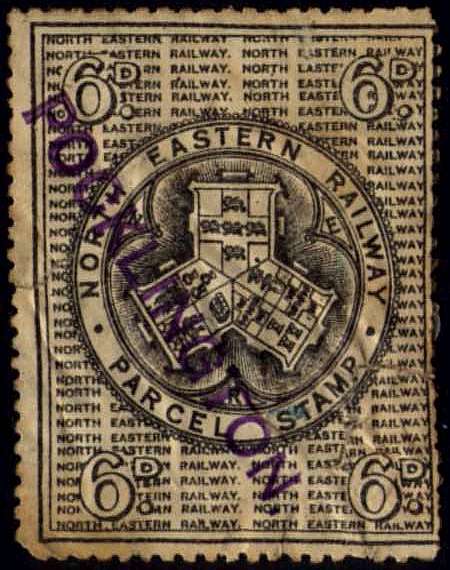 SEE ALSO - this set of pages on railway parcel and letter stamps of the world. 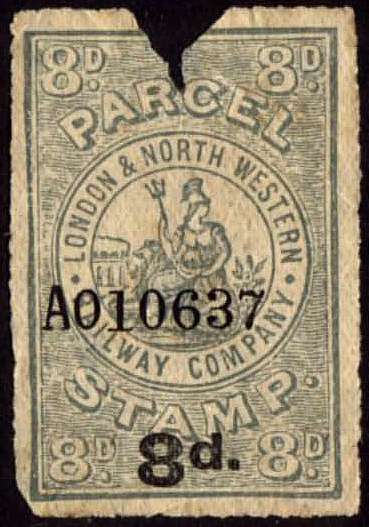 Railroads in Great Britain were probably the first in the world to issue parcel stamps, with the first ones being issued in 1846 (according to this article - though my other sources say the earliest date from 1855). 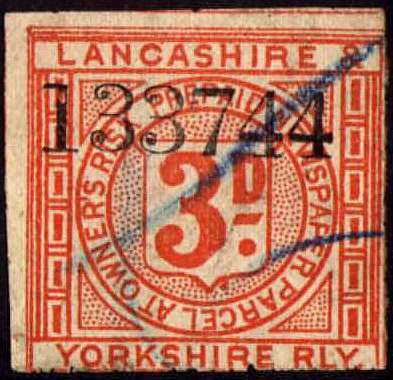 They may also have been the most prolific, but few of the stamps have survived, and the only catalogue was printed in 1906, so collecting them is a challenge. 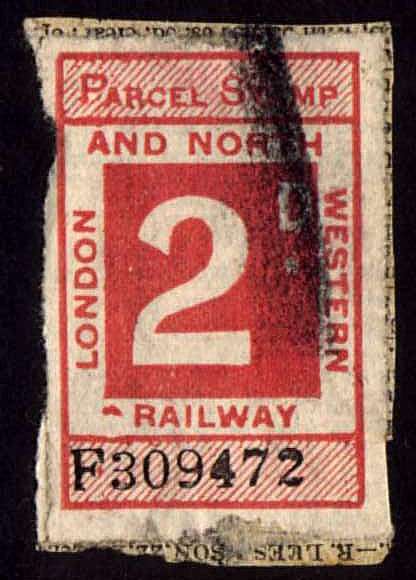 The Railway Parcel Stamps of Great Britain can be divided according to their intended use - ordinary parcels, Newpapers, other items. I have many examples of the first two, but only one of the third. 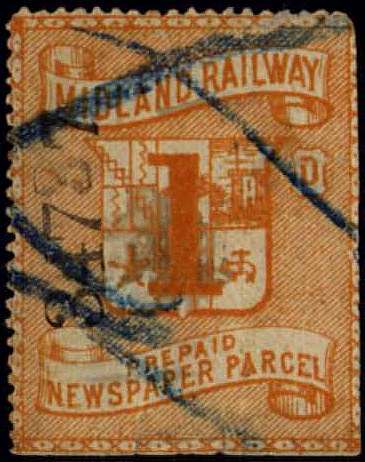 The designs differ significantly from railway to railway, as they were not regulated by the government. Still, few actually show a train. 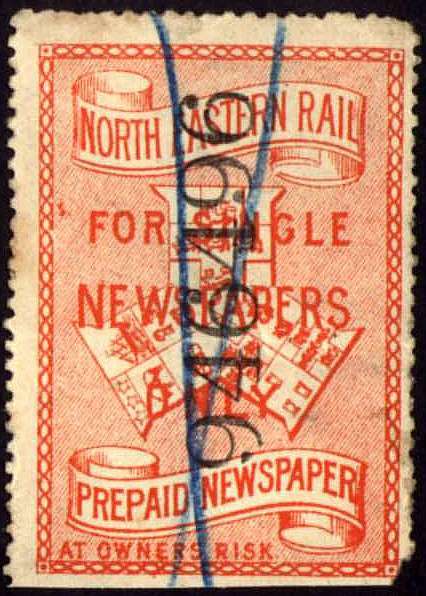 The only ones among those I own that include a train in the design are the issues of the London and North Western railway, shown below in the second and third rows, though you may need to click on one of the images and look at the enlarged version to see it, to the left of the central figure, a tiny steam train on a bridge. 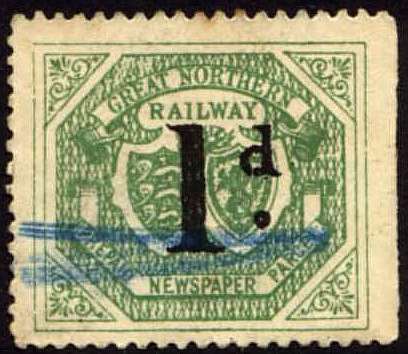 Moreover, these were not readily available to the public, except when used, and were discontinued by 1940, so relatively few are available to collectors, therefore prices for good copies are relatively high. 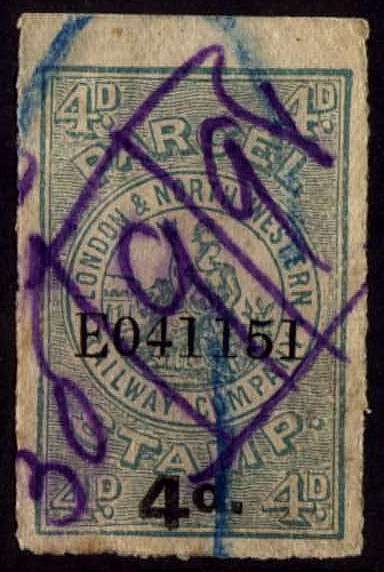 Railway Letter stamps - Though Railway Letter stamps have been used in several countries (Great Britain, Iraq, and Netherlands), Great Britain is the only place I know of where these were officially sanctioned and issued under government control, during the period 1891-1941. 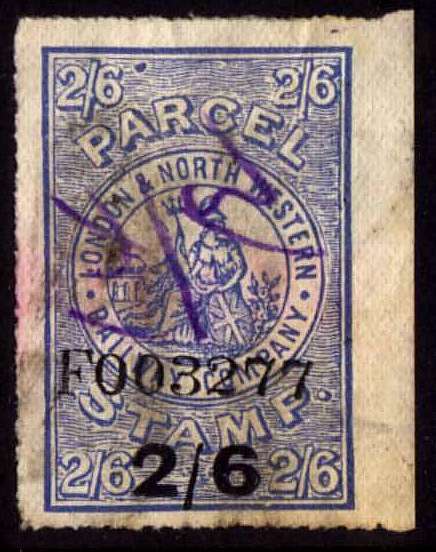 They were essentially express mail stamps. 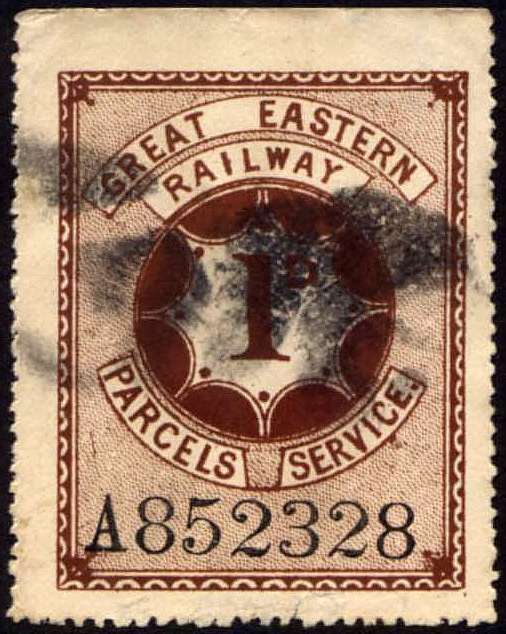 There were also stamps issued and used in the UK before that period, with sometimes questionable authority, for what amounted to private mail service by railroads. The area is a complex and interesting one, which I will not try to examine here. 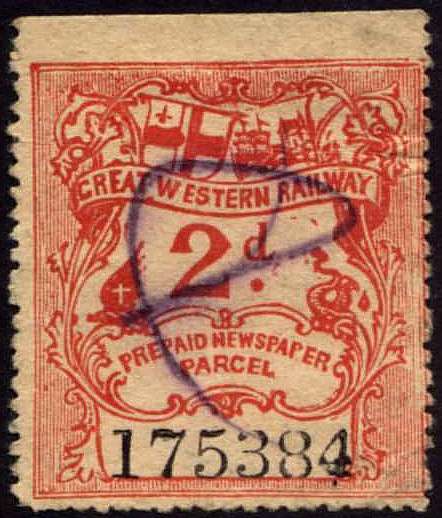 There are authoritative publications on the topic by the Railway Philatelic Group of the UK, whom I suggest you write if you wish to learn more. 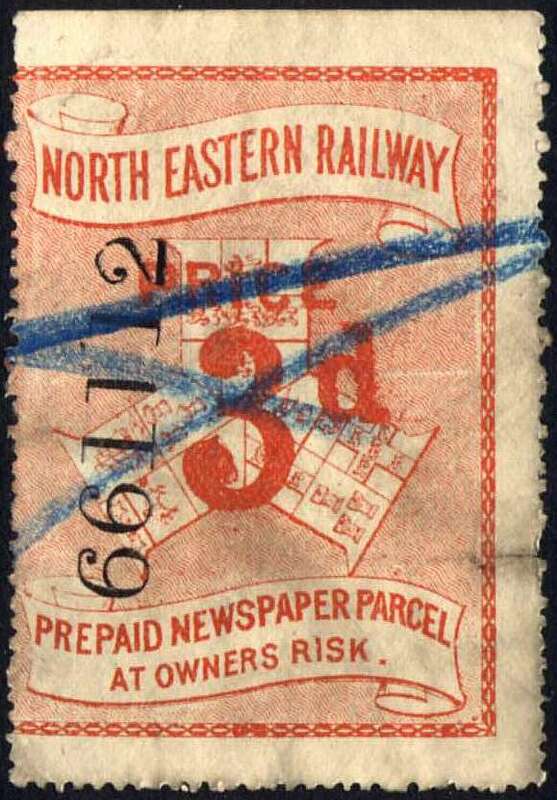 (NB - the modern "Railway Letter Stamps" issued by tourist railways and Preservation Societies such as the Tallylyn and Festiniog of Great Britain do not fall into this category - they are souvenir labels.) 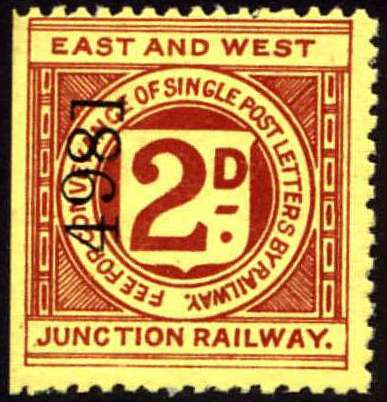 Below are eight of the real British Railway Letter Stamps. 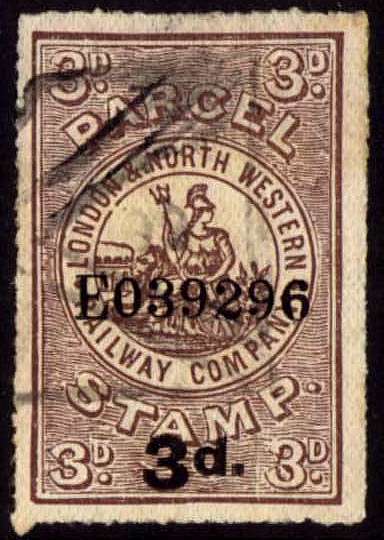 Because these stamps were issued with government approval, and under government supervision, all the designs are essentially the same, differing only in the name of the railway, the denomination, and the color. 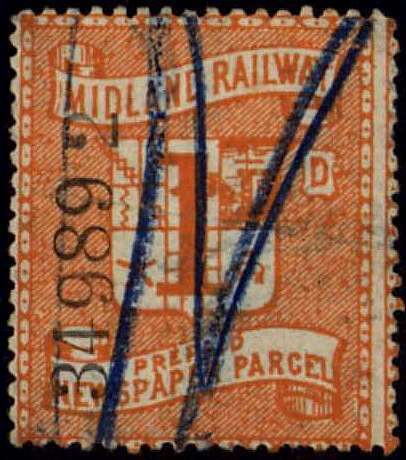 None shows a train or locomotive, so they tend to appeal only to the serious collector. 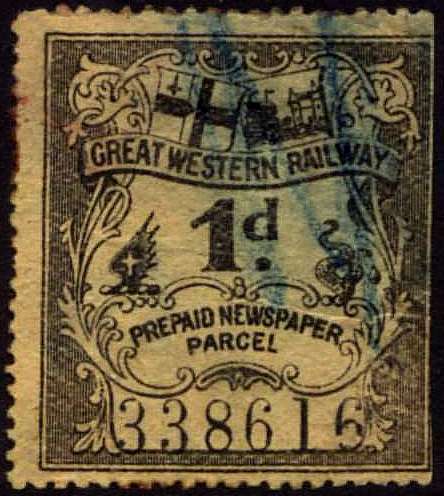 I don't seem to have any book that discusses the GB Parcel and Newspaper stamps (only ones about the Railway Letter Stamps). 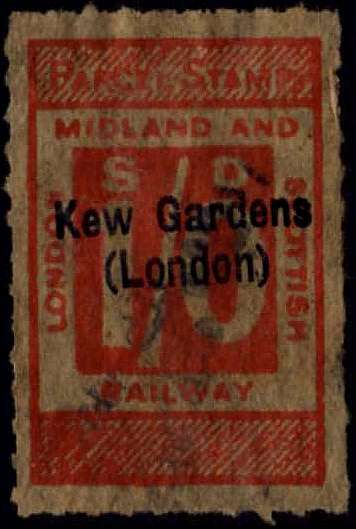 The only one is Ewen's catalogue dated 1906. 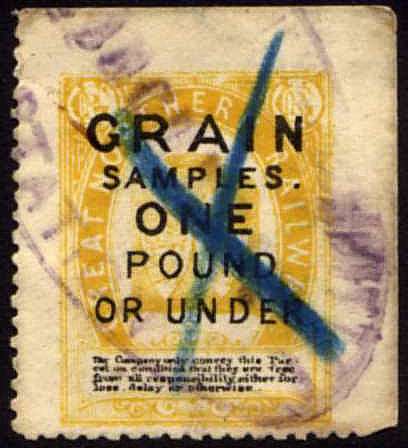 There is a reprint which sometimes comes onto the market. We are promised a new one but don't hold your breath! 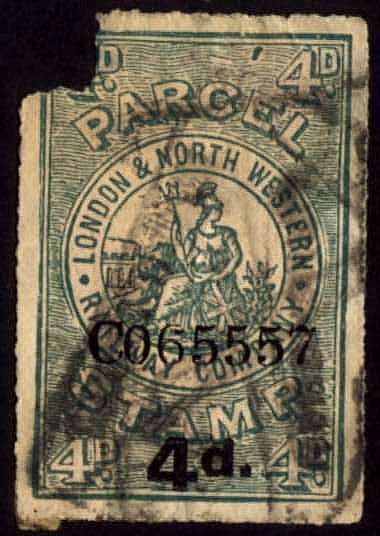 Can you tell me the approximate life span of the Parcel and Newspaper stamps? 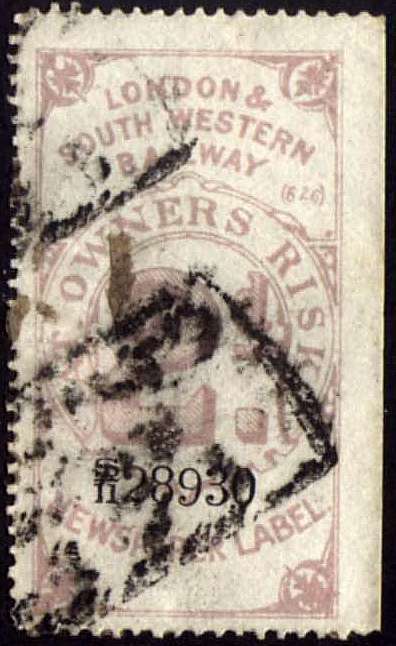 1855 until recently. 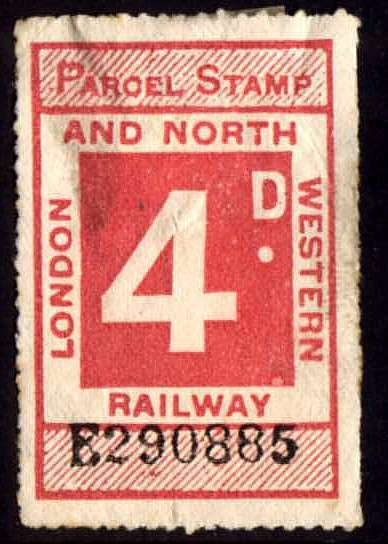 They were certainly still in use in the 1940s. 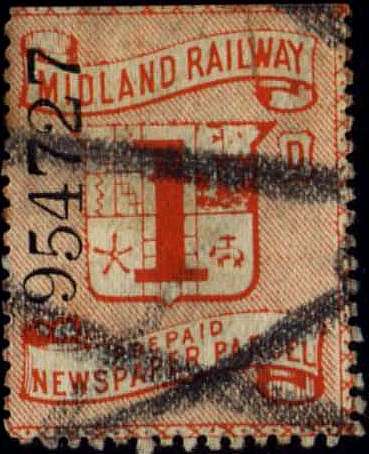 I have just found an LMS one used in 1953, and the British Rail newspaper stamps survived into the post decimalisation period (i.e. after 1971). I can't give a precise date. Maybe they faded out in the 1980s. 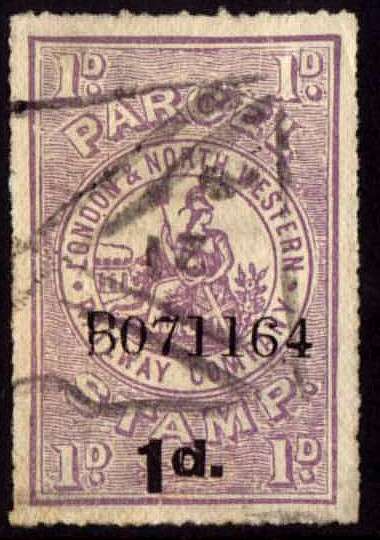 not mandated by the government, as with the letter stamps. Is that true? Absolutely correct. 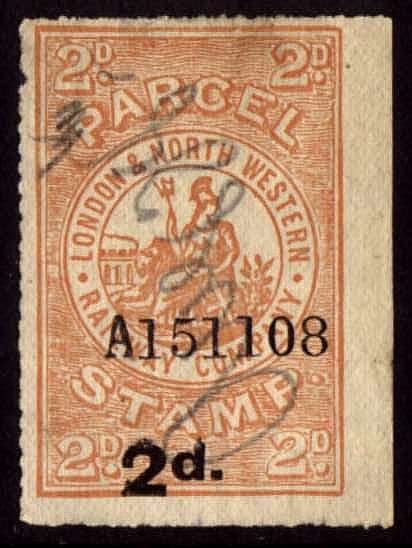 Because the Post Office had no monopoly on parcels, no Act of Parliament was required, and so the designs were unregulated. It follows that nobody knows what was issued. 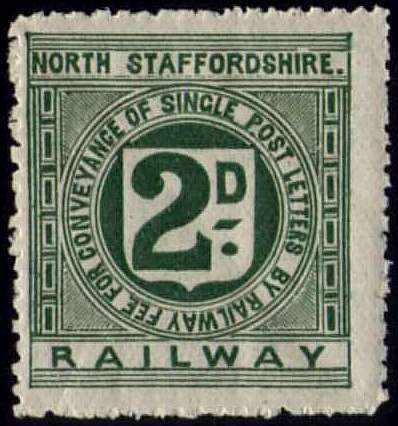 Would it be wrong to say that the modern "railway letter stamps" (Festiniog, Tallylyn, etc.) are little more than souvenirs? 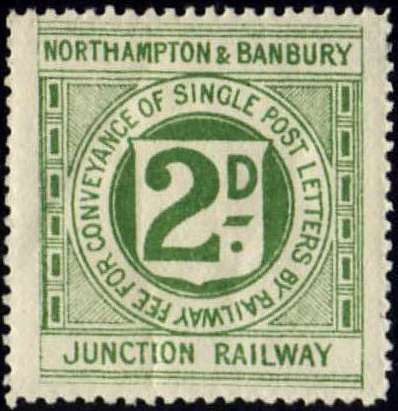 What you say is broadly true but the stamps have diminished in status in stages over the last 45 years. 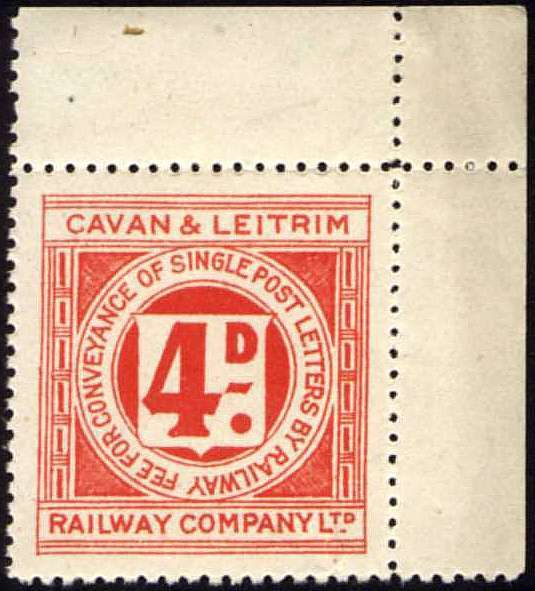 When the first modern railway letter stamps were issued, in 1957, the Railway Company (Talyllyn) was a signatory to the 1891 Railway Letter Act. 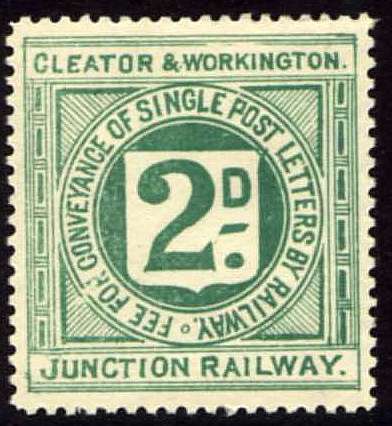 This meant that letters posted on the Talyllyn could be sent to any station on the British Railways network (BR), for no additional fee. 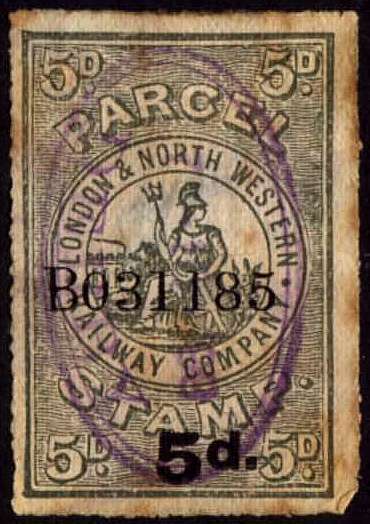 The first Talyllyn stamps therefore had the same status as the 1891 pattern railway letter stamps. 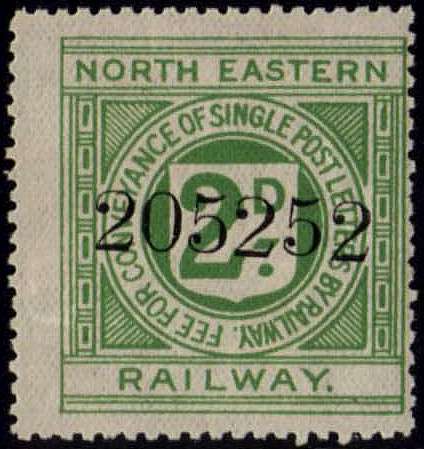 The same was true of the stamps of other private railway companies which issued them. This situation lasted until 1974. 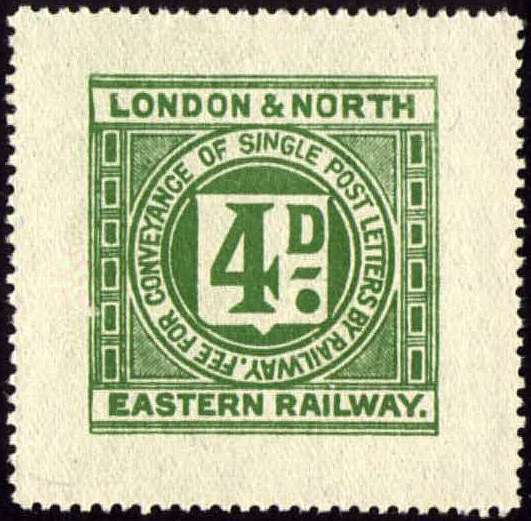 On 3rd June 1974 a new agreement with the Post Office superseded the 1891 Act. 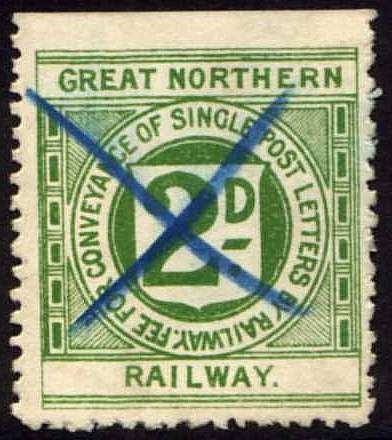 After that time letters sent from a private railway onto the BR system had to pay an additional fee to cover carriage over BR. 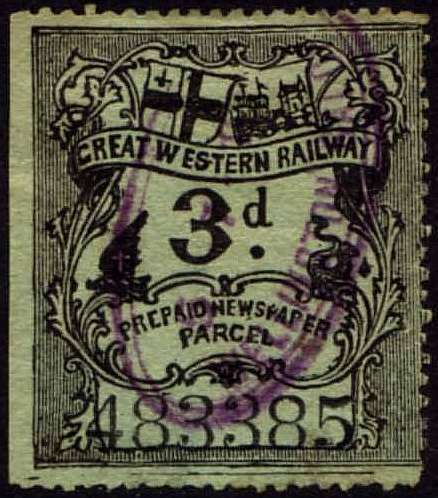 The entire fee was paid in railway letter stamps of the private company. [What accounting measures existed to make sure BR got their part of the fee I don't know.] This situation lasted for another 10 years. The last day of the BR service was 8th June 1984. 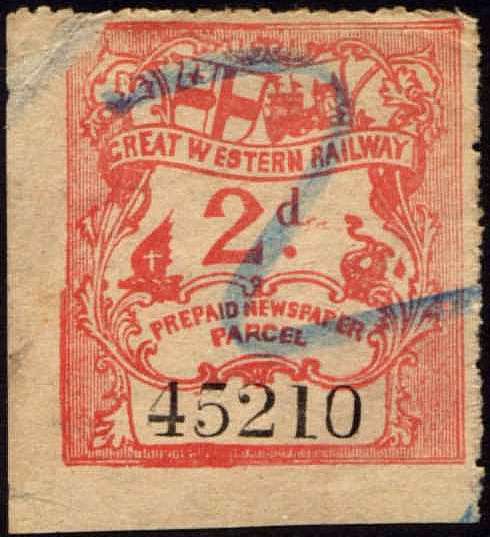 After that the railway letter stamps of the private companies could only be used to pay for carriage over that companies' line. This is the situation at present. The current fee is I believe 25p.